Your Cheeky Monkey blog. Congratulations!!!!! And THANK YOU to everyone who entered and THANK YOU to all the Etsy traders who donated some wonderful giveaways! there will be another Giveaway at the end of this month!!! 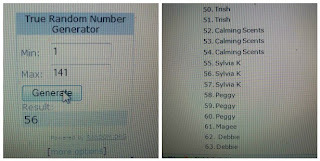 Just because......we had so many entries, I thought we should have a runner up prize of a Mystery Australian giveaway. This one went to Sylvia from Over the Hill. Congrats Sylvia and you will have to hold your breath until you know what the mystery is. And unfortunately I couldn't get Hugh Jackman! I am excited about this last mega giveaway for the month and I hope you will be too. There are so many wonderful international artists out there on Etsy.com and it is my pleasure to introduce a few to you with this giveaway. Given we all spend so much time online, let's support our local artists who trade online. TO ENTER: Leave one comment. This giveaway is open to all no matter where you live in the world. Commenters who are also members of the Lilly's Life Blog Frog Community (see right column on this page), will automatically get two extra entries. The giveaway closes on midnight Tuesday, 2 June 2009. Don't forget to click on the images to enlarge them. 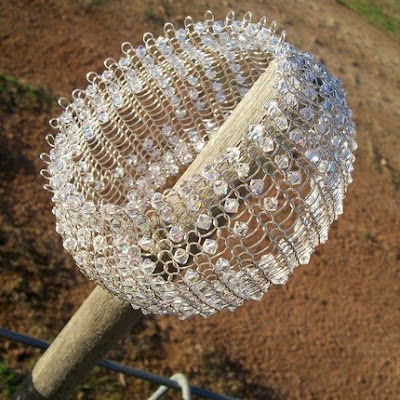 Simone Russell's handmade sculptural jewellery is exquisite. She is based in Australia and has a background in architecture and fine art and it definitely shows in the pieces she makes. She uses a unique technique to produce woven sculptural forms that are firm to the touch, organic in shape and very comfortable to wear. Her pieces are created by premium quality silver and color coated copper, sterling silver and pure silver wires woven painstakingly together... and all by hand. And she takes custom orders if you would like something specially designed. The giveaway winner will receive this elegant cuff made from Swarovski crystal. The crystals catch and reflect the light with every movement you make.It is made from premium colour and silver plated copper. One size fits most. It sits about halfway up the arm, between the wrist and the elbow. Thanks to Decorette, formerly of Melbourne and now based in Singapore, you might just get to win a taste of the LATEST TREND in home decorating! 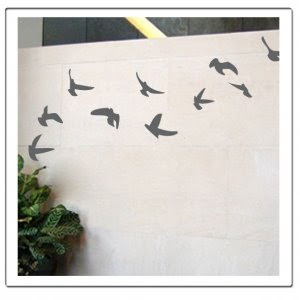 Wall decals are a fantastic alternative to painting your walls and the best thing is they can be customised to suit your needs AND are affordable! They are easy to apply and absolutely removable. Included in the give away, is a pack called Flocked. It features 17 birds ranging in size with the smallest measuring 2 inches wide x 2 inches high and the largest measuring 5 inches wide x 3.5 inches high . Simply peel and stick to transform a room instantly. And when you are ready for a change, simply peel off and you are ready to start again. You can visit Decorette's website here. They have some amazing designs and can also customise something special for you. 4. Pocket Mirror and stylish handcrafted scrabble tile Pendant from the Iszles Store and the Pendant Factory. 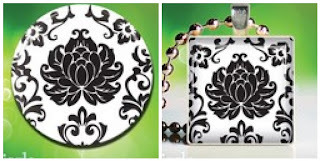 For those of you who have read my Inspiration blog you will know I love black and white and these pieces are gorgeous. However, if you win, you get to choose a pendant from the Pendant Factory and also a gorgeous Pocket Mirror of your choice from the Iszles Store which specialises in mirrors, key rings, magnets & more. They have some great products! And I love the magnets. Go visit their sites to take a look. Vanilla Pixie, based in Sydney, has the most gorgeous handmade children's hair accessories for little girls and those who are young at heart. 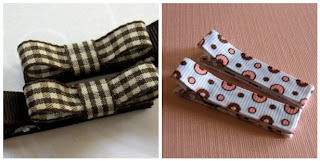 The give away is one set of Gingham Ribbon Bow non slip hair clips in the winner's colour choice of brown orange, green, blue or pink and one set of Neapolitan Dots hair slides. Adorable, and personally I think we are never too old to wear hair clips! Go and visit their Etsy store here for more great hair accessories. They are having a sale until the end of May. You can also find their blog here. The winner will be drawn at Random.org. The winner will receive prizes direct from Etsy sellers. All images are copyright and the property of the Artists featured. Lilly's Life does not receive any payment to promote these Etsy artists. I love the jewelery cuff! Please enter me too!! Hopped on the blog frog :) Count me in! What a wonderful service to Etsy owners you are doing by highlighting them here. Thanks for letting us play along! Lilly, how do I enter five hundred times? Tell me please, I will do anything,... I am that desperate to win! 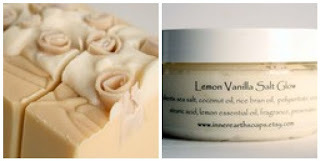 That jewellery cuff is exquisite,.. and lemon and vanilla are my favorite fragrances,... and combined,.. I can only imagine,... I just have to win. Oh my God! I'm just dying here! How do you find things so beautiful!!? Love it!! wow, would love to win any of those lovely things. id love to be in for a chance to win! My goodness, what a lovely package to win. You know Lilly I have been commenting on your blog for a year but never have thought about setting my own blog up until now in order to get another two entries in this give away I think I may have to. Jewellery - incredible never seen anything like that, soaps, truly decicious, decal, yes please, pendants definitely black and white and hair clips, what girl could resist these. Fantastic. Thanks Lilly and all you great Etsy sellers. And Random.org PLEASE let me win. This is fabulous.Men out there if you had any sense you all would be entering this. Imagine how happy this could make your girlfriends and wives. thats three entries for me - one for the wife, the girlfriend and the other girlfriend. You know I am joking Lilly dont you I only have one girlfriend and wife, lol! I am drooling over these pictures like they are chocolate cake. Oh wow what a fantastic Give-away! I'm in love especially with that soap! What a fabulous giveaway. Eeeep. Hope I win! Fabulous products! Count me in. Thanks for sharing all of your fantastic finds with us, Lilly. And of course, the wonderful artists behind them, too! oh can I play too?? What an amazing bunch of items!! Thank you for letting me know about this Lilly! I love all of these gifts,,all of them. The Cuff is so me, the birds would be great in my hideaway and the soaps--ummmm!!! Okk I think I'm entered! What lovely gifts! I love them all! Yep, sign me up! Love that cuff! And I love Vanilla, too! I've been having some connectivity problems so haven't been around a lot lately, but not from a lack of interest!!! I'm in it to win it. Love the cuff, so unusual and downright gorgerous! Love you too! Wow, the cuff is amazing, the soaps gorgeous, the birds unusual, the pendant so sweet and the clips adorable. I think I am on the frog Lilly. These giveaways are gorgeous as are all your giveaways. I LOVE everything here! What an incredible line up ... I'm in! Is it cheating if I enter? That jewellry is amazing!!! What an awesome giveaway... 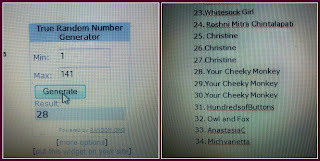 I hope my number comes up! Oh my gosh - what a LOVELY bracelet - and that vanilla soap looks soooo delicious - like fudge... Oooooh. And all of this stuff - Just super fantastic. Thank you for offering this - I was FORCED here by a flying Monkey post on Blog Catalog. LOL! OK Lilo Lil, You've twisted my arm, I 'LOVE' jewellery of any kind - me old Scots grannie was a magpie you see! Anything that 'sparkles' has me by the neck and I just can't resist it! Is this enough of a 'pleading' rant for you missus ??? Love and Cheers Peer! Guess Who? All these are great giveaways. Well done Etsy sellers. wow! what an amazing competition and amazing etsians. Id love to enter pls. Seriously these are gorgeous, all of them. count me in. Enter me! I especially like the wall decals. Hi, yes pleeeaaassseeee - they all look marvelous - count me in please! These are amazing - that cuff is devine, the soaps to die for and love the decals. The hair clips are so sweet and the pendant so cute too. Love it all. These are amazing. Well done artists! Wooo, count me in! I love the look of everything here! Came over from SITS to say Hello! I would love to be included in this giveaway. Thanks! This package looks amazing! Count me in! I added myself to your bloglog. How wonderful. That cuff is simply gorgeous and the soap, the Flocks, the mirror, ribbons. All so fun. Great giveaway! I love that cuff - so pretty. Gorgeous stuff...especially that cuff! Also love the adorable pocket mirror and pendant. How beautiful. What talented artists you know:-) Please enter me! Great Giveaway! Thank you, visiting from SITS. Just got here via SITS! WOW, what a giveaway...such fabulous goodies! Oh, enter me...enter me...enter me!! What a fabulous giveaway! You Rock! I'm ON this, and I'm following. WOW!!!! Such fabulousness!! Love it! Absolutely awesome giveaway!! Would love to be the winner! I have my fingers crossed! What a great giveaway. It is all so beautiful! Fabulous! I love that cuff! Those soaps look good enough to eat! Please enter me! And I'm trying to join your community! Oh wow my little girls would love those hair clips and I would so love everything else. I am loving the items in this giveaway...the birds decal? I already know where they will be going. Thanks for this. I would love win anything in this giveaway. I tried also to join your community but it didn't work. Some help please? Michael and Ermilene C and Lynn are the same person, for some reason Google uses my official name sometimes...sorry. I hope I'm not too late to enter!! What a great collection of items. Please pick me! what an amazing array of items! all beautiful. Wow what a generous and beautiful collection of items! I love them all! Thanks! I'd like to direct you to my giveaway, not sure if it is relevant to you, but would make a great gift for someone if it isn't. these are all so great, wouldnt every woman love these. Isnt it amazing there are so many clver people out there crafting these? Thank you to all the artists. Oh I hope I win. My goodness! This has to be the best giveaway EVER! Please enter me- I'll be keeping everything crossed until you announce the winner! These are great, really beautiful, I love the cuff, and love the pendant and mirror too!